I have been trying to use the decresendo mark (the greater than arrow). I can place it where I want it, but when I play it back the song doesn't fade out. (This is the end of the song). Any suggestions? Please give me step by step instructions. I am just a hobbyist - not a trained musician. Thank you. FINALE 2014.5, Windows 7, not using any MIDI (do I need too?). if you put a p or pp dynamic at the end of the decrescendo does it work? Chord symbols have a mind of their own. I can't say about that. You might have to use the MIDI Tool to get a real fade out. P.S. : I can get a MIDI Volume fade to work, but I have to turn off HP to get it. HP has a mind of its own as well. Expressions do not (necessarily) affect all layers of an instrument, and chords are treated as a separate layer. 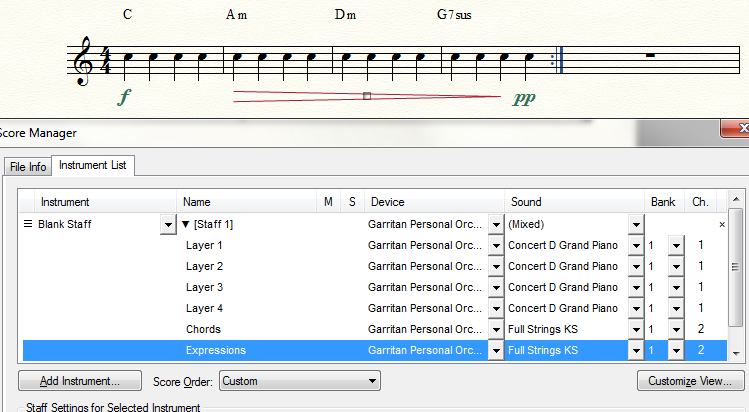 Try setting the "Expressions" "layer" to the same instrument as your chords; that is apparently what the Expressions "layer" is for. This file has been downloaded 136 time(s). Unfortunately, your file doesn't change volume at all for me. When I change the instrument to piano, then the notes dim, but not the chords, even when they are on a different channel along with expressions. The point is that the string chords dim when the Expressions is set to the string patch used in the chords (in VST). When I set Layer 1 to oboe and Expressions to oboe, the "melody" dim's but the chords do not. Perhaps it works differently for velocity instruments than for sustaining instruments. Since I have a different aria player version, it wiped out the sounds, so I didn't know what you had used. Now that you mention what they were, I can test it. It took me years to find out (from MM) what Expressions actually did. It appears to be a vestigial attempt to align dynamics with specific layers, but since it can only work for one layer, it is not of much use for two instruments on a staff. Still, it's nice to know what it does. Once can always use another tool in the toolbox.